I finished the first book A Discovery of Witches (see my review) just days before Shadow of Night came out. Though it took me a while to get to it, I think A Discovery of Witches was my most look forward to reads in my TBR pile. And it didn't disappoint. What I was disappointed about was that my library didn't immediately have Shadow of Night available. I had to wait a month to get my hand on it. I loved it just as much as the first book. In Shadow of Night, we are transported back to 1590 by Diana's time-walking magic. It wasn't exactly what historian Diana was expecting, but she seemed to adapt better than Matthew. Can you imagine what it would be like to relive a life you already lived? Matthew struggled with being the 1590 Matthew - his ideals and what he thought was acceptable in the 16th century is not how the 21st century Matthew feels anymore. 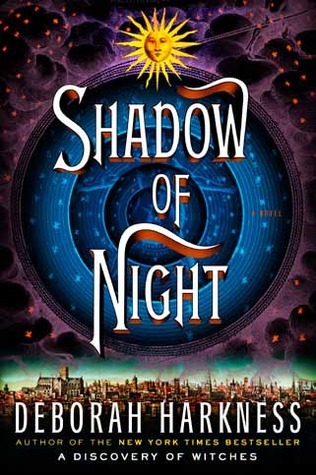 Shadow of Night read a bit slower for me, but as a commenter on Monday pointed out it was a denser read. That is definitely true. I felt like I was trudging (in a good way) through the thick threads that Diana and Matthew traveled through. When I read A Discovery of Witches, I thought it was more for fans of Twilight, Charmed, Buffy the Vampire Slayer as it focused more on the lore of vampires and other creatures. When I finished Shadow of Night, I immediately thought "This is for Harry Potter fans who are now all grown up". We delve more into the magical world that Diana is woefully undereducated about. Another aspect that made me thing of Harry Potter was the need to re-read it. I have read all the Harry Potter books multiple times. There is so much story in Shadow of Night that you can't absorb it all in the first reading. I was so anxious to get to the end (much like I was for Harry Potter and the Deathly Hallows), that I don't think a grasped all that was taking place. I can't wait until the paperback edition comes out so I can get my own copy (I like my series to match and courtesy of Viking, my copy of A Discovery of Witches is paperback). Your turn: I think A Discovery of Witches/Shadow of Night would make a great book club/party book. Wine is pretty prominent in the story, so maybe Wine Tasting with All Souls' Trilogy. Would you go to a book club/party? What would make good discussion questions? I love how DH made he setting as authentic as it can be but there's too much to absorb. I remember reading 3 pages (kindle) about Diana's wedding gown, describing it in detail. Plus chapter 7, a filler chapter, when the ones with Ysabeau in the present was enough to emphasize what "changes" they were doing in the future or lack thereof. I also found Diana's reunion with her dad a little dry.